It is only a few months before the yearlong centennial celebration of the International Astronomical Union (IAU) will take place. As a big kick-off event, the global project 100 Hours of Astronomy is organised on 10-13 January 2019. Everyone around the globe can participate in this joint effort to bring astronomy to the general public. In 2019, November 12 to 15, Japan will host the first IAU symposium on Astronomy for Equity, Diversity and Inclusion. The aim of the symposium is to be a roadmap to action within the framework of the IAU centennial anniversary, highlighting the role diversity and inclusion plays in producing better science, contributing for competitiveness and innovation and focus on specific actions. The International Astronomical Union (IAU) is eager to celebrate its 100th anniversary. 2019 will mark a year-long celebration to increase awareness of a century of astronomical discoveries as well as to support and improve the use of astronomy as a tool for education, development and diplomacy under the central theme “Under One Sky”. The IAU 100 Years celebration in 2019 will consist of global and regional events that will reach a worldwide audience of millions of astronomers, industry leaders, educators, and more. On 22 August 2018, the Inspiring Stars exhibition was opened to the public at the General Assembly of the International Astronomical Union (IAU), being held at the Austria Center Vienna. Inspiring Stars is a travelling international exhibition, led by the IAU and supported by the American Astronomical Society, that is designed to highlight, support, and promote inclusive initiatives to address equity and equality of participation in the field of astronomy. Inspiring Stars — IAU inclusive world exhibition is a travelling international exhibition led by the International Astronomical Union (IAU) and supported by the American Astronomical Society (AAS). It is designed to highlight, support, and promote inclusive initiatives to encourage equality of participation in outreach and teaching, and at a professional level in the field of astronomy. The exhibition will be inaugurated on 22 August in the Austria Center Vienna, during the IAU General Assembly 2018 in Vienna, Austria. The IAU invites all attending members, members of Austrian organisations that cater for people with disabilities and/or impairments, the Austrian astronomical community, and members of the public to visit the exhibition and the special events taking place during the inauguration. Starting this summer, children from all over Puerto Rico will be able to explore space from their own schools’ backyards. 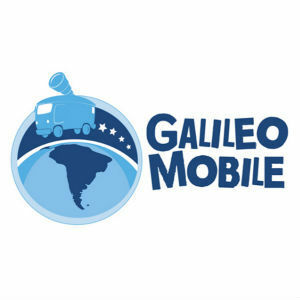 The non-profit organization Astronomers Without Borders and Ciencia Puerto Rico (CienciaPR) will distribute donated telescopes to 20 underserved schools in Puerto Rico. 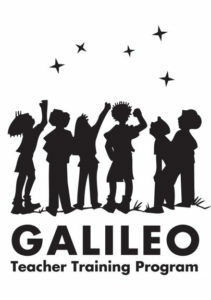 In addition to the telescopes, the schools will receive science education resources that include “The Universe at Your Feet”, a collection of astronomy activities in Spanish for children and classrooms, and celestial planispheres or maps to help identify visible stars and constellations. This is all part of a new collaborative initiative called “Astronomía al Servicio” (Astronomy in Service), which seeks to promote education, scientific exploration, and citizen participation. Making current astronomy research accessible to the blind and vision impaired community. The International Astronomical Union is one of the main partners of the project “A Global Approach to the Gender Gap in Mathematical and Natural Sciences: How to Measure It, How to Reduce It?”. The aim of the project is to better understand the current problems faced by academics and practitioners around the world in the fields of mathematics, computing, and natural science academics. One of the specific tasks for the project is to collect data via a joint global survey across the world to inform policymakers from all countries, especially developing countries, about reducing the gap between men and women in the fields of mathematics, computing, and natural sciences. This is an interdisciplinary collaboration of eleven partners, led by the International Mathematical Union and the International Union of Pure and Applied Chemistry and supported by the International Council for Science over the triennium 2017–2019. Issue #87 of the IAU CC1-Newsletter is now online! Braille Periodic Table with the relative height of an element representing its density. Re-examining braille, creating an easy to use a tactile reading system, by utilizing modern printing & technology. Astronomy is an inherently visual science. AstroSoM explores how sound complements more traditional astronomy data analysis and brings the excitement of astronomical discovery to people with visual impairments. Each month, AstroSoM features a different sound produced from real astronomy data, along with a brief explanation written by a real astronomer. AstroSoM is supported by a National Science Foundation Astronomy and Astrophysics Postdoctoral Fellowship. On 24 March 2018, the eight Communicating Astronomy with the Public Conference (CAP) 2018 started at the Fukuoka City Science Museum, in Japan. This was the largest CAP Conference ever, with around 450 participants from 53 countries across all continents, except Antarctica, attending. Submit an abstract to the third International CHIANTI TOPICS focus workshop. This year, 2018, the focus will be on Inclusion and intercultural aspects in astro-tourism activities under the title ‘The Hitchhiker’s Guide to the Galaxy’. The workshop will be held in Tuscany, Italy from 11 -13 July 2018 at the Osservatorio Polifunzionale del Chianti, University of Florence. The workshop is organized under the patronage of the International Astronomical Union, the Italian National Institute for Astrophysics and the University of Florence. Here you can find a quick link to Hands in the Stars listing of words in different sign languages. Hands in the Stars is the first international comparative list of astronomical words in sign languages. Additionally, the community around the world has been sharing with us very interesting resources in their own languages. You can find a list of signs contributed by individuals here. Here you can find many interesting signs as “komet” (comet) and “asteroide” (asteroid). An official collection of signs exists here. You can find, for example, “stjerne” (star) or “planet” (planet). Un dictionnaire encyclopédique international d’astronomie pour les langues des signes a été mis en ligne le 7 décembre 2017 sur le site de l’Union Astronomique Internationale. Il résulte d’un projet initié en 2009 par Dominique Proust, astrophysicien à l’Observatoire de Paris. The purpose of the JSESD is to provide a forum for the presentation of research and exemplary practice in the field of science education as it relates to teaching students with disabilities and a vehicle for dissemination of information to practitioners in the field. A main goal of the JSESD is to publish reports of research. However, reports of practical information, position papers, letters to the editors, product reviews and resources to improve science education and services for students with disabilities are also accepted. The editorial board consists of educators (K-Postsecondary), scientists, and scholars in the area of science education and disabilities service with expertise in diverse disciplines. JSESD will be of interest to all members of academia who work with students with disabilities. The IAU-Office of Astronomy for Development’s (OAD) sixth annual call for proposals has concluded, and 16 projects have been selected to receive funding in 2018. The OAD call for proposals in 2017 was conducted in two stages. A total of 114 applications were received at stage 1 from which 40 were selected to proceed to stage 2 after review by the task forces. The OAD then received 35 full applications by the deadline of 15th September 2017. The three Task Forces reviewed all the completed applications and submitted recommendations to the Steering Committee, which approved the final list of projects. The total amount that will be granted to the funded projects will be €112,661. Language France (LSF) has enabled a remarkable advance in communication, both in the knowledge of deaf culture and by the use of sign language, thus removing any barriers between the deaf and the hearing. Hands in the Stars, is an encyclopedic dictionary of astronomy in French Sign Language, by Dominique Proust. You can find the latest new edition publish under the IAU Astronomy for Development grant system in English, French and Spanish. The October issue of the IAU Commission C1 – Astronomy Education and Development Newsletter is now online! In this edition, we highlight:. Improving Accessibility of Astronomical Publications, Hands in the Stars: An Encyclopaedic Dictionary of Astronomy for Sign Language in French, English and Spanish. Feelif is a high-tech company with a focus on information systems for blind and visually impaired people. Their goal is to empower blind and visually impaired people so that they can easily access information in digital form. Check their latest interesting educational products on their official website. It is with immense pleasure that we announce that Dr Wanda Diaz Merced has been featured on BBC 100 Women and is now in the same club as the likes of Marie Curie and other all-time greats! Recognising the importance of a wide range of ethical, behavioural and professional issues affecting astronomy, the Council of the EAS (European Astronomical Society) has formed a working group on Ethics. This working group has produced a report which Council has discussed and now wishes to put forward for consultation by the EAS membership. The Council the EAS membership to read the report and send any comments and suggestions to the working group, through the dedicated email address eas.ethics.wg[at]gmail.com, by the 31st of October, 2017. Comments can be submitted by individuals, groups, or collectives such as national societies. The Working Group will consider all comments and use them to produce the final version of the report, to be adopted by Council in January. Kimberly Arcand, April Jubett& Kelly Williams (Chandra/SAO) ran two 3-hour workshops with 20 visually impaired high school & college students total, along with 3 National Federation of the Blind (NFB) staff assistants at the NFB Youth Slam, on July 26 and 27 at Towson University, Baltimore. Students learned about stars and light, before exploring the upcoming total solar eclipse with NASA tactile/Braille booklets on the Eclipse as well as “Touch the Sun”.Dr. Wanda Diaz Merceddemonstrated sonification of variable stars remotely.Next, stellar evolution was introduced, with hands-on exploration of numerous NASA/Chandra 3D printed models (Cassiopeia A, SN1987A, & V745Sco), including tactile/Braille panels on supernova remnants. Students contributed input to help improve the architecture of the 3D models for handling by blind and visually impaired audiences (an IRB was in place). Finally, the sessions ended with an exploration of a new Lego-based CasA tactile model, with input solicited from the students, as well as a general Q&A. Wanda Diaz from the IAU Office of Astronomy for Development (OAD) along with Rob Hart, Daniel Davis and Allyson Bieryla from Harvard University have developed an Arduino based device that will allow people to listen to the August 21 Total Solar Eclipse. This Arduino can detect the change in brightness and convert light to sound. The sound will be a higher pitch when there is more light and a lower pitch when the Moon is eclipsing the Sun. Instructions are included on how to build your own device. A live audio stream of the eclipse will be available here, on August 21, 2017. Week-long Career Exploration Lab Workshop in collaboration with the South Carolina Commission for the Blind, utilises 3D printer technology to help blind and visually impaired students age 15 to 18 explore STEM careers using tactile models and sonification techniques, and to introduce students to blind professional role models with successful STEM careers. You can find a PowerPoint PDF explaining the goals of the workshop and showing highlights from the week’s activities. Additionally, the team is also trying to find a community to share resources and expand their program and ideas. This webpage is a teaching aid designed to make sign language accessible to everyone. Here you will find an international dictionary of the following national sign languages: Swedish, English (BSL), American English (ASL), German, French, Spanish, Portuguese, Russian, Estonian, Lithuanian, Icelandic, Latvian, Polish, Czech, Japanese, Turkish. American Sign Language and baby signs are also included in this dictionary. This webpage is administered by the Non-Governmental and Non-Profit Organization European Sign Language Centre. Though the primary objective of the Centre is to make national sign languages available to people with hearing disabilities, the overall ambition is to make sign languages accessible to everyone. This project is an ongoing process of documenting national sign languages, we have come quite far, but much remains. The project needs your assistance! If you want to support their work, including any ideas or thoughts that you wish to share, please contact the team at info@spreadthesign.com. In ESA’s first event of its kind, members of the public have been invited to touch, taste and hear about life in the Universe in an immersive day of activities that are suitable for the sensory impaired. The event at ESA´s European Space Astronomy Centre (ESAC) near Madrid, on 5 June, is part of the activities of the Space Inclusive Network (SpaceIn), an initiative supported by ESA aiming at using science and technology to promote a culture of diversity and inclusion in space projects. From May 25 to 26, Tokyo hosted the Asia-Pacific Gender Summit 10 – “Better Science through Gender, Diversity and Inclusive Engagement”. In the summit participated 603 attendees from 23 countries and districts. The IAU Office for Astronomy Outreach team was present at the meeting and will share their report in the upcoming month. For Global Astronomy Month (GAM) 2017, Astronomers Without Borders (AWB) are teaming up with our Working Group and have compiled a list of thirty resources to be highlighted during April. People with special needs are often overlooked when planning outreach and educational activities and remain a group still frequently excluded from events. The thirty resources highlighted are a free, open source collection intended to support and facilitate the implementation of activities for people with disabilities. The selected best practices, programs, examples of activities, resources and activities guidelines are dedicated to helping outreach and education groups that aim to reach these particular audiences but need more support for doing it. If intelligent life without sight exists on some distant planet in our galaxy, these lifeforms would still explore the universe; how? This is a guiding question for Innovators Developing Accessible Tools for Astronomy (IDATA), a new research initiative supported by the U.S. National Science Foundation – STEM + Computing Partnerships (STEM+C) Program. A series of free short gifs with sign language words and expressions on general topics such as Education, People & Familly, Emergency & Disaster, Transportation & Travel, and much more (USA). Attention Hypatia fans around the world! Currently, 20 March is being petitioned as an ideal date to commemorate the first female astronomer — Hypatia of Alexandria. As the petition gains momentum — there are 40 participating countries overall, Uruguay, Colombia, Venezuela, Nicaragua and Chile having recently joined — the organisation is aiming to formalise a proposal to UNESCO so that on Hypatia Day we can globally celebrate Women in Science day. El universo cabe en una maleta. Los planetas, el Sol, las constelaciones, la Luna y otros cuerpos celestes hacen parte de Astronomía con Todos los Sentidos, un proyecto educativo itinerante para personas con discapacidad visual, creado por el Planetario de Medellín con el apoyo de la Office of Astronomy for Development -OAD- y la Unión Astronómica Internacional. Today we celebrate #DayOfFacts and reinforce our commitment to the IAU’s mission to promote and safeguard the science of Astronomy in all its aspects through international cooperation. Our WG stands by this statement, supporting initiatives that can take Astronomy to everyone, independently of their ethnic origin, religion, gender, citizenship, special needs, language, political inclination and sexual orientation. Everyone has the right freely to participate in the cultural life of the community, to enjoy the arts and to share in scientific advancement and its benefits. The Fabric of the Universe – exploring the connection between dark matter and woven textiles. by Mary Treseler, O’Reilly Media, Inc. This 1-meter star map contains visible stars without a telescope for the southern hemisphere, represented according to their respective magnitude and the constellations can be identified from the printed names in Braille. The model was split in several pieces for a standard 20cmx20cm printer. This star map was made as a part of an installation by ITEDA Mendoza for popularization of Astronomy for Tecnopolis science fair in Argentina, supported by FOPAA (Fundación Observatorio Pierre Auger Argentina). The International Astronomical Union (IAU) is profoundly concerned by the impact the recent US executive order, and possible reactions to it from other countries, could have on international collaboration in astronomy and the mobility of scientists. The IAU’s mission is to promote and safeguard the science of astronomy in all its aspects through international cooperation. The organisation currently counts 79 countries among its National Members and includes members from a further 19 countries. With 2841 professional astronomers in the IAU, the US is the country with the largest number of IAU members. Another 47 IAU members come from some of the seven countries affected by the recent executive order (Iran, Iraq, Libya, Somalia, Sudan, Syria and Yemen), and hundreds more from other Muslim-majority countries. The IAU considers that mobility restrictions imposed by any country, similar to the ones recently included in the US executive order, run counter to its mission, which is inspired by the principles of the International Council for Science (ICSU) on the Freedom in the Conduct of Science. Such restrictions can have a direct impact on the astronomical communities of countries at both ends of the ban, as well as astronomy as a whole. In 2015 the IAU held its General Assembly in Honolulu, Hawai’i, USA, which hosted more than 3000 astronomers from 74 countries all over the world, including some of the seven countries concerned by the US executive order. The meeting had an estimated economic benefit of around $10–20 million on the state. The IAU urges US officials to develop new screening measures to take into account the absolute necessity of mobility of scientists for the benefit of the USA, the rest of the world and science itself. The IAU firmly opposes any discrimination based on factors such as ethnic origin, religion, citizenship, language, and political or other opinion and therefore expects US officials to not discriminate on the basis of religion. The IAU hopes that such actions from a country do not trigger a chain reaction in other countries around the globe, which would severely damage the science of astronomy, and encourages everyone to value cooperation, tolerance and peace. Find the latest recommendations by the Working Group. The Working Group on Accessibility and Disability of the American Astronomical Society (WGAD) has been working on a document, the Publication Accessibility WGAD, with the support of the Commission of Education and Development. The working group hopes that this will initiate groundswell of inclusion in Astronomy everywhere in the world. For further comments, please contact Dr. Wanda Diaz Merced. As part of the IAU Commission C1 Astronomy Education and Development activities and in particular of the WG Astronomy for Equity and Inclusion, we have the pleasure to announce the first Workshop on Astronomy Beyond the Common Senses for Accessibility and Inclusion. This workshop is developed as part of the Latin American Regional IAU Meeting (LARIM) 2016, on October 8th, in Cartagena de Indias, Colombia. This one-day meeting intends to be an interdisciplinary meeting with participation from astronomers, educators and disability specialists and provides a unique opportunity to develop new strategies, share experiences, and participate in workshops designed for audiences with disabilities. The content will feature different programs such as resources for the blind and visually impaired, for educators that wish to expand their activities in formal and informal environments and disability experts that will share their best practices with the audience. The organizing committee especially encourages professional astronomers that wish to broaden their experience and learn how to incorporate a more disability accessible environment in their research teams and their professional work. Find more about the latest version of the program here. On 24 to 26 of September 2016, Tokyo will host the 3rd Japanese symposium dedicated to Universal Design Astronomy. This year the Organizing Committee is proud to announce the broadening of the reach of the meeting, from national to international, welcoming all non-Japanese speaking participants with Japanese to English translated sessions and a full day dedicated to international programs. During this three-day event, the participants will not only watch and listen to lectures but will be part of a “sharing space” that will provide individual practice and experience. The underlying goal of the selected workshops is to make the participants exchange resources, activities, and ideas. After the symposium, each attendee will be able to implement activities with the resources learned and create new ones – this meeting will provide formal and informal educators with the know-how to disseminate astronomy to people with disabilities in their communities and make their activities more inclusive. The program includes special invited speakers Wanda Diaz Merced from the IAU Office of Astronomy for Development, South Africa, and Amelia Ortiz-Gil from the Astronomical Observatory of Valencia, Spain. On behalf of the Organizing Committee, we warmly invite you to join us in Tokyo and share your experiences with us and the over one hundred participants attending the symposium. You can find more about the program here. Thank you and if you need any additional information, please contact us. You can download the brochure of the Symposium in .pdf version here. This symposium is a result of the strong collaboration between the National Astronomical Observatory of Japan (NAOJ), the IAU Office for Astronomy Outreach (OAO), and the Japanese Society for Education and Popularization of Astronomy (JASEPA). And is part of a series of workshops supported by the IAU Astronomy for Equity and Inclusion WG. The WG3 according to different areas of action has prepared a short Google questionnaire in order to find out more precisely which are your field(s) of expertise and interest. The form is here. This form collecting information on activities for equity and inclusion aims to gather basic information of volunteers. This will facilitate to distribute the many tasks based on interest and experience. If you’d like to share your activities in more detail with the working group, please go here. I have navigated the page using the NonVisual Desktop Application NVDA (available on nvaccess.org ), windows 10 operative system and google Chrome. If the user is using an android device, it is assumed the “talk Back Option” is on. The user will be successful by using the default settings of NVDA to navigate the page. Do not use the browsing mode ( NVDA + f7) as this page only has three links at the bottom which are Report abuse, Terms of Service, Aditional Terms links. Use the tab button in NVDA to navigate and fill this form. After writing the name continue tabbing to go to the Editing-fields, named Affiliation and Email. The form lands directly on the field where the user should enter the information. Tabbing will take the user to the next one. After those fields, the user will find multiple choice questions. The NVDA screen reader will read the question and will focus on the first clickable choice. The screen reader will read it, the user may choose or not. Tabbing will take the user to the next clickable option of that question. The options in the question will finish when the screen reader finds an editable text field . The editable text field usually activates when the user clicks on the “other” option. Tabbing will take the user to the next multiple choice question. The user should find 3 of those questions and the last question is just an editable text field. That will be the end of the information required. Tabbing again will take the user to the submit button. If the user was successful the screen reader will change focus to another page and will read the heading and that the response has been recorded. It will provide the option to edit the response if desired. Using browsing mode (NVDA + F7) will show the 3 links the page contains. You can now find the website for the “First workshop on Astronomy Beyond the Common Senses for Accessibility and Inclusion” here. 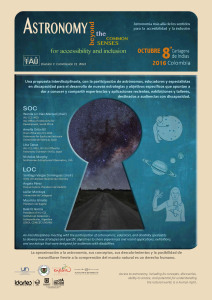 As part of the CC1 activities and in particular of the objectives of the WG3: Astronomy for Equity and Inclusion, we have the pleasure to announce the first workshop on Astronomy Beyond the Common Senses for Accessibility and Inclusion. This is an interdisciplinary meeting with participation from astronomers, educators and disability specialists. This workshop provides an opportunity to develop new strategies, work toward specific objectives, share experiences, discuss recent applications, and participate in workshops that were developed for audiences with disabilities. The workshop will be developed as part of the LARIM 2016, on October 8th, in Cartagena de Indias, Colombia, and with the support from the Universidad Nacional de Colombia, Sede Bogotá-Facultad de Ciencias, Universidad de Cartagena, Parque Explora y Planetario de Medellín, Idartes – Planetario de Bogotá. We have also the pleasure to have as chair of the SOC, the help of Wanda Diaz-Merced, a blind astronomer, associated member of the Division C.
Dr. Nancy Brickhouse, Center for Astrophysics , Massachusetts. Dr. Mathews Schneps, Laboratory of Visual Learning Massachusetts Institute of Technology and University of Massachusetts Boston. Dr. Cassandra Runyon, College of Charleston.